Creators can be a little frustrated when you point to an early work of their as your favorite. Naturally, they feel that they’ve grown and developed as a creator since their early stuff, and that their newer work is generally better. But while skills can improve with experience, sometimes other factors in an early work overwhelm the arguably-weaker craft that went into a work and make it the favorite of some of their fans. So it is with me and The Death of Jean DeWolff, which is no-question, it’s-not-even-close, my favorite of all the works I’ve ever read by writer Peter David, yet it is (to my knowledge) his first published comics work. Some years ago I had him autograph my paperback collection at a convention, and I was a little put off that he sort of mumbled something I didn’t catch when I said how much I loved the story, and signed it with a Star Trek symbol next to his name (he was deep in the Star Trek era of his career, I think). Maybe he harbors some bad memories about the time he wrote Spider-Man, but perhaps more likely he felt a little awkward having a fan gush over his earliest work when he’s done so much more since then that he probably feels is more sophisticated and just-plain-better. I don’t know – I certainly wasn’t inclined to ask him at the time. 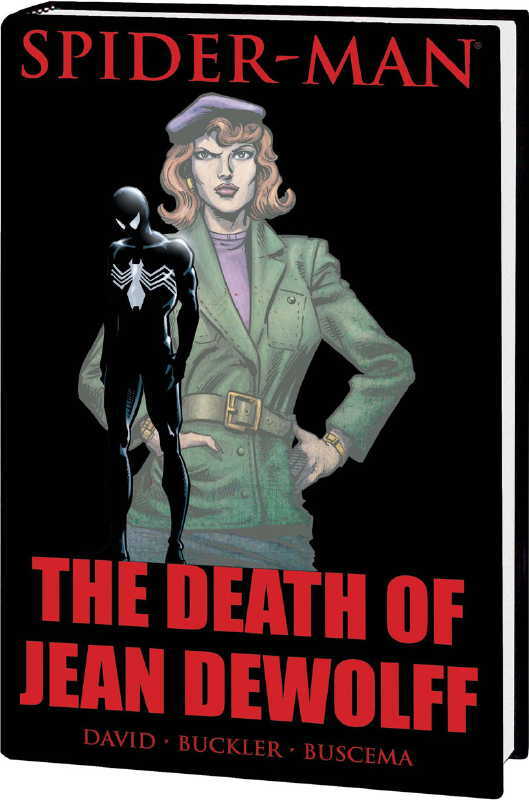 Nonetheless, here we are: I’m delighted to see that Marvel has given The Death of Jean DeWolff, in my judgment Peter David’s best work, the deluxe hardcover treatment. Now, when this came out in 1985 I was not following Spider-Man, and even today I’ve never read another story with Jean DeWolff in it. Apparently she was a supporting character on the police force in Spidey’s books for a few years. But she was enough of a character in his life that when she’s brutally executed at the beginning of the story Spidey is motivated to help the police find the killer. Teaming up with wry police detective Stan Carter, he learns that a masked nut named Sin-Eater killed her, and is killing other prominent figures in New York. While the mystery of the Sin-Eater’s identity is what initially drives the story, what makes it great is the conflicts the hunt imposes on Spider-Man: The Sin-Eater is all-too-willing to let loose with his shotgun in the middle of a crowd when Spidey’s after him, raising questions about whether Spider-Man’s partly responsible for anyone who gets hurt. (Similar issues come up in the real world when someone gets hurt when the police elect to engage in a high-speed chase.) Spidey’s fellow hero Daredevil, and his alter-ego of lawyer Matt Murdock, also gets involved when a friend of Matt’s is killed, demonstrating the contrast between the two heroes (at least, at the time): Spider-Man is a hero who works to do what’s right, but it basically a vigilante with something of a black-and-white outlook on justice, while Daredevil, who’s both a lawyer and is somewhat older and more worldly, has a more nuanced view, though one which sometimes conflicts with his own vigilante adventures. The two end up on opposite ends of a thorny ethical debate at the conclusion of the story which David handles deftly and satisfyingly. It’s a very emotional and human story, but one which would be difficult to tell with characters who weren’t masked vigilantes. This story includes everything I most enjoyed about David’s writing: His humor is sharp and pointed, with few cheap shots, and his characterizations are vivid (several of Spidey’s supporting cast shine along the way). The plot is tight and there’s little wasted space or verbiage; the pacing is perfect, down to the issue-by-issue cliffhangers. The storytelling is helped considerably by Rich Buckler’s pencils; Buckler is something of a forgotten man in comics history, it seems to be, having been one of a number of Neal Adams-influenced pencillers (the best of them, really), but one who never illustrated any hugely popular stories. With terrific inks (mainly by Brett Breeding), he really shines here. [We] killed off a character who had a lot of potential. Readers couldn’t fathom why we did that, “Why kill off a character with whom you could have done so much?” Ah, but where is the dramatic impact in killing off someone with no potential? Someone who the readers are sick of? There’s no drama in that, no sense of “It might have been.” Death should be a tragedy, not a relief. Perhaps in a world where moviegoers laugh at innocent teens being slaughtered by masked madmen, that’s been forgotten. That this story works so well even for me, who had no emotional connection at all to Jean DeWolff, both proves David’s point, and further illustrates how well he executed this story. The new hardcover also has the 3-issue sequel to the original story (from 1987). I was disappointed in this story when it came out, in large part because it’s illustrated by Sal Buscema, of whose art I’ve never been fond (I always preferred his brother John’s style). But reading it today I think it works fine. Once more it’s about the consequences of power as wielded by Spider-Man, and about the demons that haunt a man who’s done terrible things, and whether he can ever truly be rid of them. As a sort of variation on a theme compared to the original, and bringing some closure to some matters left over from the first story, it’s a success. This is one of the great superhero comics, and a high point for a character who’s seen plenty of them in the last half-century. Seize this opportunity to check it out.